Follow two girls as they put their stamp on the design world. In case you missed it, yesterday, we discussed simple ways to dress up your boys' rooms for Christmas. A few swaps in the bedding, a few adornments and, of course, the all important tree. Today, it's time for the girls! Several of the main elements were used in both spaces, but we swapped the red for a muted pink and the lumberjack feel for a little whimsy by way of snowflakes and texture. And, again, all of these items are from Target. There are so many great deals that can really transform your child's space. I can't wait to get to work in my girls' rooms! Jon has an off day before he heads out on another trip, so we're starting to deck the halls today! There's just so much joy, sparkle (literally) and comfort in Christmas decor. In fact, we love it so much we thought, "Why not extend the holly and jolly to the kids' bedrooms?" I mean if there were ever such a place for wonder and delight it's there, right? Starting with the gentlemen...Here's how to dress up your boy's room with a few touches of holiday cheer...all from Target! There are some great deals...$20 tree, $14 flannel twin sheets, etc. And they are all pieces you could use for years to come. My favorite piece might be that wood garland. So cute! We hope you enjoy decking the halls! We'll be back with decor for a girl's room later. If there's one way to finish off a bedroom or nursery with a designer's touch, it's with great bedding. Just as we are against a matching set of furniture, so too are we against the good ol' "bed in a bag." I know that these are made in an attempt to have you believe that by using the pieces provided, you'll achieve custom-looking bedding but I assure you, the opposite is true. Mixing and matching bedding pieces is the way to go--and it's so fun! Mixing and matching colors, textures and patterns will instantly give your bedding a beautiful layered look that was thoughtfully put together. Below I've outlined a few of my favorite online bedding resources for adults and children/babies for easy shopping. Don't be afraid to mix and match items from different retailers to finish your look! 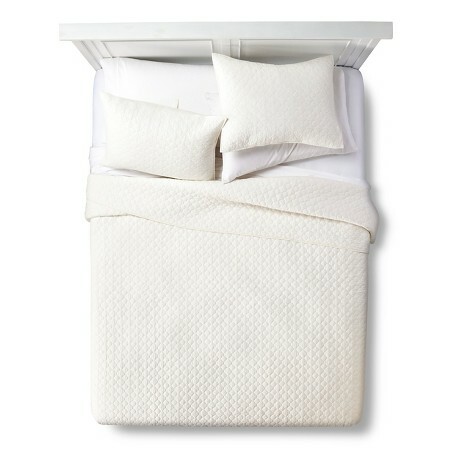 They have a lot of great foundation pieces (linen duvet covers, solid quilts) on which to build the rest of your bedding. I also love their patterned sheets to add a little fun to any room. And furthermore, they have great sales! Bedding is what they do so naturally they are going to have a lot of great options. Beautiful, subtle patterned sheets and shams, soft duvets outlined in every color of the rainbow and gorgeous scalloped sheets that I mentioned here. They also usually run a lot great sales. This retailer is not new to anyone. My favorite pieces from them are the embroidered duvets and pick-stitch quilts. They also have a new line of greek key throws that are amazing. They have well-designed crib sheet patterns (that are also super soft), a bedding basics collection with bumpers/crib skirts in every color and an assortment of unique pieces like this macramé crib skirt. Home to whimsical and playful bedding options from crib sizes up to a queen (something that's usually hard to find in kid-friendly prints). They also have an assortment of duvets and unique crib bedding. And when they run a sale, it's usually a great one! If you're looking for soft tones, comfortable fabrics and subtle patterns, RHBC is your guy. I'm particularly fond of their washed linen and matelasse crib bedding collections. They also have a ton of great sheet options and will send you swatch samples for free! So the next time you're looking to update your bedding, give these sources a look first and say "good bye!" to the bed in the bag! Not so long ago, I stumbled upon a photo of a great kids' space on Pinterest. My husband and I ooh-ed and ahh-ed over it, and then I swear one of us pinned it, and now it is lost forever. I swear I spent an hour looking for it only to turn up with nothing. Nothing even remotely close to how great that space worked. And it was a great lead-up as the inspiration for this post. So you'll just have to take my word for it. Also, as much as I love adding a few vintage, restored and repurposed pieces in just about every room, kids just don't appreciate that. They like new, bright, shiny. Once your kid is running and talking, they can think on their own. They have opinions. They like the pink sparkle keds, no matter how much you want them to like the red chucks. They'd much rather wear the dinosaur shirt than the monogrammed one. They're kids. What can ya do? Vertical Bookshelf and Storage Cubes - Probably the most widely used storage piece for kid stuff. It's so versatile. Ikea would be a fool to get rid of it. Pom-Pom Garland - No particular source for this. First because it's easy to make yourself, and secondly because every crafty person on Etsy makes them. Bean Bag Chairs - Not the most inexpensive option, but functional, stylish, and they have a removable cover! Winner! Wood Table and Chairs - I'm not even sourcing these because it would depress all of us. This is the Eames plywood table and chairs, or as they're more popularly called--the "potato chip chair." I love them. They love me. And they come in kid sizes, making them even more irresistible. Should you ever find these in a thrift store or on Craig's List, it is part of your civic duty to call me immediately. Now that we've covered that, Ikea makes a perfectly good table and chair set for kids that's made of unstained, unfinished pine. We have it. It's unbeatable for the money. Rug - Indoor/Outdoor. Essential for kids because that equals "hard to ruin." Supply Cart - I've seen this cute cart used so many ways. It's adorable and functional. Win-win. Chalkboard Paint - Pretty much anywhere these days. We used Valspar and so far no complaints. I used a lot of Ikea products in this room for several reasons. Most obviously, it's inexpensive. Ikea makes great products for grown-ups, but I think they take the gold on their children's products. If you don't have kids you'd never know because you probably whiz straight past this section and onto the swedish meatballs and $5 photo frames. But I'm telling you--it's great. We discovered it on our last trip and couldn't break away. They don't just sell "toys", you know? All of their products are well-thought out and have some learning built into them. You can also find great wood and metal play-thing options (making the environmentally conscious parent's feat of avoiding plastic more possible), and for the length of time your kid actually uses the things you purchase, they really stand the test of time. $20 for a wood table and 2 chairs?? SOLD. There are a few more expensive items in this room, but keep in mind, this is an inspiration mood board. If you keep your eyes open, you can find some great deals on similar items that may work just as well. Or you may find the price justifiable for your wallet based on the use it will get in your home. All-in-all, it's a feasible space that will get plenty of use from ages 2 on up. The pieces are intended to stick around and change in use with your kids' needs. Does your playroom need a functional overhaul with the help of a trained design eye? Try E-Design. We would love to help you! Pensacola based interior design studio. Offering both traditional full-service design and e-design.